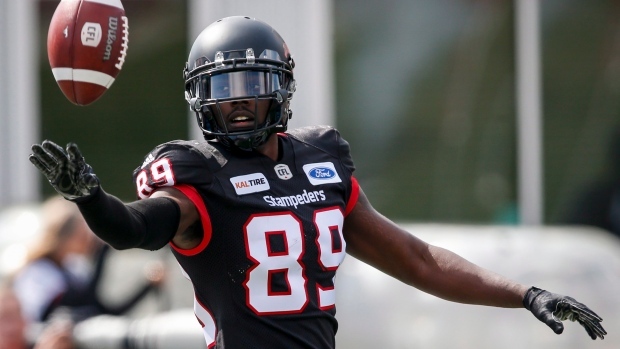 It appears the Calgary Stampeders have suffered another significant injury to their receiving corps. During an appearance on the Sportstalk with Jock radio show in Calgary, head coach Dave Dickenson confirmed wide receiver DaVaris Daniels suffered a broken collarbone on Saturday during their 43-28 win over the Hamilton Tiger-Cats. Dickenson said he wasn't sure how long Daniels would be sidelined for. The 25-year-old is putting together a solid season in Calgary, recording 50 receptions for 747 yards and seven touchdowns. This is his third season with the Stamps. Daniels joins receiver Kamar Jorden, who is out for the season with a torn ACL, and receiver Eric Rogers, who remains out after undergoing knee surgery in early August. The Stamps hold a 10-2 record and sit first in the CFL.